Abstract. Contemporary climate warming over the Arctic is accelerating mass loss from the Greenland Ice Sheet through increasing surface melt, emphasizing the need to closely monitor its surface mass balance in order to improve sea-level rise predictions. Snow accumulation is the largest component of the ice sheet's surface mass balance, but in situ observations thereof are inherently sparse and models are difficult to evaluate at large scales. 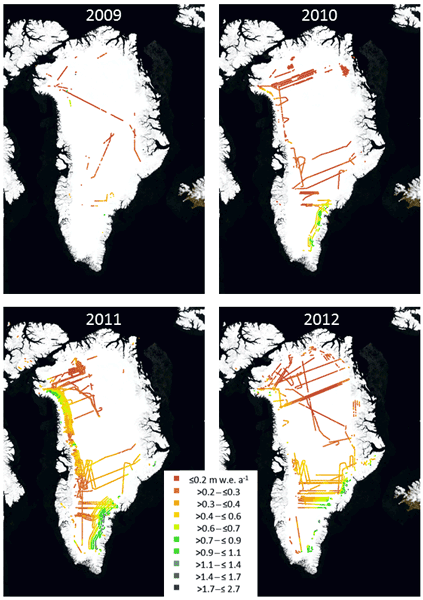 Here, we quantify recent Greenland accumulation rates using ultra-wideband (2–6.5GHz) airborne snow radar data collected as part of NASA's Operation IceBridge between 2009 and 2012. We use a semiautomated method to trace the observed radiostratigraphy and then derive annual net accumulation rates for 2009–2012. The uncertainty in these radar-derived accumulation rates is on average 14%. A comparison of the radar-derived accumulation rates and contemporaneous ice cores shows that snow radar captures both the annual and long-term mean accumulation rate accurately. A comparison with outputs from a regional climate model (MAR) shows that this model matches radar-derived accumulation rates in the ice sheet interior but produces higher values over southeastern Greenland. Our results demonstrate that snow radar can efficiently and accurately map patterns of snow accumulation across an ice sheet and that it is valuable for evaluating the accuracy of surface mass balance models. How to cite: Koenig, L. S., Ivanoff, A., Alexander, P. M., MacGregor, J. 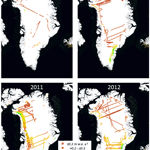 A., Fettweis, X., Panzer, B., Paden, J. D., Forster, R. R., Das, I., McConnell, J. R., Tedesco, M., Leuschen, C., and Gogineni, P.: Annual Greenland accumulation rates (2009–2012) from airborne snow radar, The Cryosphere, 10, 1739-1752, https://doi.org/10.5194/tc-10-1739-2016, 2016.